Spectacled Weaver, Range-change map between SABAP1 (1987-1991) and SABAP2 (2007-current). 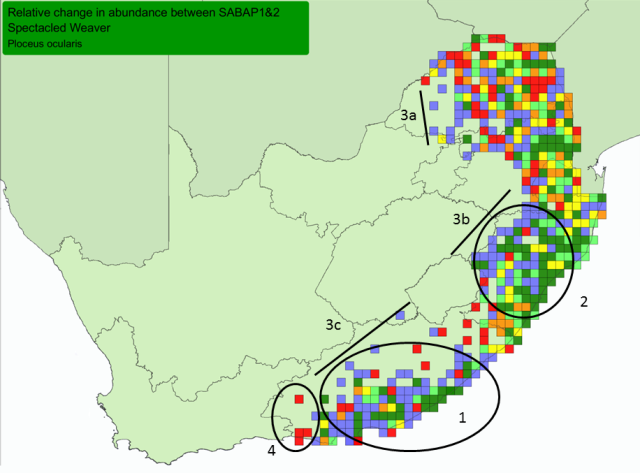 In South Africa the Spectacled Weaver has more grid cells with increases in reporting rate than cells showing decreases, between SABAP1 (1987-1991) and SABAP2 (2007-). Not shown in this map is current SABAP2 distribution which shows that the core of the range of the Spectacled Weaver in South Africa as coastal KwaZulu-Natal; there is good SABAP2 coverage in the Kruger National Park but the Spectacled Weaver occurs at a low reporting rate there. 3a,b,c. The western edge of its range in South Africa (other than the western edge in the Eastern Cape). 4. The western edge in the Eastern Cape. Equatorial Guinea: at RÃ­o Muni, appears to be addition to country list (Demey 2015b).